Since its inception in 1993, Kala Pola - Sri Lanka’s largest open air art fair - has been enjoyed by a multitude of both locals and expats including a coterie of VIPs, celebrities, art connoisseurs and students. A panel discussion, which segued into the announcing of Kala Pola 2019, was held at Duke’s Court, Cinnamon Lakeside on February 6. Held in conjunction with The George Keyt Foundation, Kala Pola 2019 marks the 25th year of unbroken patronage for the event by the John Keells Group as its main CSR initiative under the focus area of Arts and Culture. Based on the value of nurturing and sustaining the arts and the livelihood of artists for balanced social development, Kala Pola serves to offer a plethora of opportunities for aspiring as well as established artists with potential lucrative financial opportunities both within and outside the event. “It is interesting and heartening to note that the number of people who have visited and bought art from Kala Pola throughout the years has increased rapidly. Last year alone, Kala Pola has helped artists earn sales exceeding Rs.15 million at the event supported by a visitor count exceeding 28,000. This number alone is testament to the value generated by such an initiative,” Chairman of The George Keyt Foundation, Michael Anthonisz, said. Fostering a sense of learning, networking and marketing art while also providing an inimitable experience for both the artist and buyer alike has been the core philosophy of Kala Pola where a myriad of styles from contemporary to classical to abstract can be enjoyed. 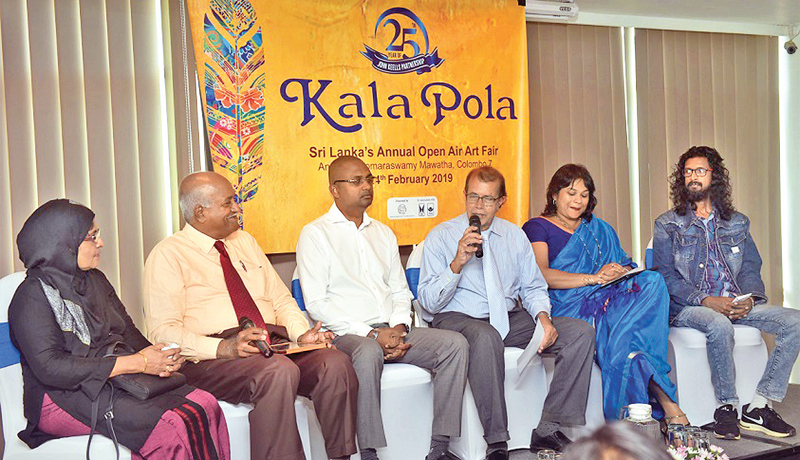 Kala Pola 2019 will be held on Sunday, February 24 from 8am to 9pm on Ananda Coomaraswamy Mawatha (Green Path) and will feature a kaleidoscope of creativity and colour from across the nation.